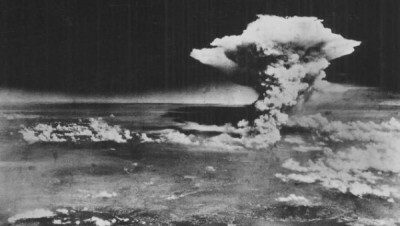 Image: A mushroom cloud billows about one hour after a nuclear bomb was detonated above Hiroshima, Japan on Aug. 6, 1945. This August 6th and 9th millions of people will mark the 70th anniversary of the nuclear bombings of Hiroshima and Nagasaki in those cities and at events around the world. Some will celebrate the recent deal in which Iran committed not to pursue nuclear weapons, and to comply with the non-proliferation treaty (NPT) and with requirements not imposed on any other nation. Yet, those nations that have nuclear weapons are either violating the NPT by failing to disarm or by building more (U.S., Russia, U.K., France, China, India), or they have refused to sign the treaty (Israel, Pakistan, North Korea). Meanwhile new nations are acquiring nuclear energy despite possessing an abundance of oil and/or some of the best conditions for solar energy on earth (Saudi Arabia, Jordan, UAE). Nuclear missiles containing more than the entire bombing power of World War II in a single bomb are aimed by the thousands at Russia from the United States and vice versa. A thirty-second fit of insanity in a U.S. or Russian president could eliminate all life on earth. And the United States is playing war games on Russia’s border. The acceptance of this madness as normal and routine is part of the continued explosion of those two bombs, begun 70 years ago and rarely properly understood. The dropping of those bombs and the explicit threat ever since to drop more is a new crime that has given birth to a new species of imperialism. The United States has intervened in over 70 nations — more than one per year — since World War II, and has now come full-circle to the re-militarization of Japan. The history of the first U.S. militarization of Japan has been brought to light by James Bradley. In 1853 the U.S. Navy forced Japan open to U.S. merchants, missionaries, and militarism. In 1872 the U.S. military began training the Japanese in how to conquer other nations, with an eye on Taiwan. Charles LeGendre, an American general training the Japanese in the ways of war, proposed that they adopt a Monroe Doctrine for Asia, that is a policy of dominating Asia in the way that the United States dominated its hemisphere. In 1873, Japan invaded Taiwan with U.S. military advisors and weaponry. Korea was next, followed by China in 1894. In 1904, U.S. President Theodore Roosevelt encouraged Japan in attacking Russia. But he broke a promise to Japan by refusing to go public with his support for its Monroe Doctrine, and he backed Russia’s refusal to pay Japan a dime following the war. The Japanese empire became seen as a competitor rather than a proxy, and the U.S. military spent decades planning for a war with Japan. Harry Truman, who would order the nuclear bombings in 1945, spoke in the U.S. Senate on June 23, 1941: “If we see that Germany is winning,” he said, “we ought to help Russia, and if Russia is winning we ought to help Germany, and that way let them kill as many as possible.” Did Truman value Japanese lives above Russian and German? There is nothing anywhere to suggest that he did. A U.S. Army poll in 1943 found that roughly half of all GIs believed it would be necessary to kill every Japanese person on earth. William Halsey, who commanded U.S. naval forces in the South Pacific, vowed that when the war was over, the Japanese language would be spoken only in hell. On August 6, 1945, President Truman announced: “Sixteen hours ago an American airplane dropped one bomb on Hiroshima, an important Japanese army base.” Of course it was a city, not an army base at all. “Having found the bomb we have used it,” Truman declared. “We have used it against those who attacked us without warning at Pearl Harbor, against those who have starved and beaten and executed American prisoners of war, and against those who have abandoned all pretense of obeying international law of warfare.” Truman said nothing about reluctance or the price necessary for ending the war. In fact, Japan had been trying to surrender for months, including in its July 13th cable sent to Stalin, who read it to Truman. Japan wanted only to keep its emperor, terms the United States refused until after the nuclear bombings. Truman’s advisor James Byrnes wanted the bombs dropped to end the war before the Soviet Union could invade Japan. In fact, the Soviets attacked the Japanese in Manchuria on the same day as the Nagasaki bombing and overwhelmed them. The U.S. and the Soviets continued the war on Japan for weeks after Nagasaki. Then the Japanese surrendered. The war wasn’t just over. The new American empire was launched. “The revulsion against war … will be an almost insuperable obstacle for us to overcome,” said General Electric CEO Charles Wilson in 1944. “For that reason, I am convinced that we must begin now to set the machinery in motion for a permanent wartime economy.” And so they did. Although invasions were nothing new to the U.S. military, they now came on a whole new scale. And the ever-present threat of nuclear weapons use has been a key part of it. Truman threatened to nuke China in 1950. The myth developed, in fact, that Eisenhower’s enthusiasm for nuking China led to the rapid conclusion of the Korean War. Belief in that myth led President Richard Nixon, decades later, to imagine he could end the Vietnam War by pretending to be crazy enough to use nuclear bombs. Even more disturbingly, he actually was crazy enough. “The nuclear bomb, does that bother you? … I just want you to think big, Henry, for Christsakes,” Nixon said to Henry Kissinger in discussing options for Vietnam. And how many times has Iran been reminded that “all options are on the table”? [T]he Japanese people forever renounce war as a sovereign right of the nation and the threat or use of force as means of settling international disputes. … [L]and, sea, and air forces, as well as other war potential, will never be maintained. The new “reinterpretation,” accomplished without amending the Constitution, holds that Japan can maintain land, sea, and air forces, as well as other war potential, and that Japan will use war or threaten war to defend itself, to defend any of its allies, or to take part in a U.N.-authorized war anywhere on earth. Abe’s “reinterpretation” skills would make the U.S. Office of Legal Counsel blush. U.S. commentators are referring to this shift in Japan as “normalization” and expressing outrage at Japan’s failure to engage in any wars since World War II. The U.S. government will now expect Japan’s participation in any threat or use of war against China or Russia. But accompanying the return of Japanese militarism is the rise of Japanese nationalism, not Japanese devotion to U.S. rule. And even the Japanese nationalism is weak in Okinawa, where the movement to evict U.S. military bases grows stronger all the time. In remilitarizing Japan, rather than demilitarizing itself, the United States is playing with fire.